As a leading manufacturer of resilient rail pads to protect concrete rail sleepers from damage caused by the dynamic forces of passing trains, Andhra Polymers is one of the few approved suppliers of grooved rubber pads to the Indian Railways. Its grooved rubber pads are also used extensively in India and abroad. Dimension: 10 mm.thick, 12mm. thick., 6mm. thick. Dimension:10 mm.thick, 12mm. thick., 6mm. thick. - We can supply rail pads of thickness ranging from 5mm to 25mm thick. - Pads made of metal bonding are used to reduce extensive vibrations. 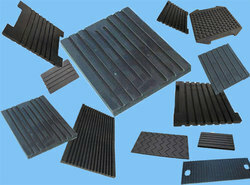 Rubber Pads/ Grooved Rubber Sole Plates are made up of rubber or plastic to dampen the shocks of vibrations of a passing train. 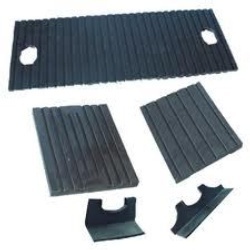 The manufacturing, supplying and exporting of Groove Composite Rubber Rail Pads is done as per the industry standards. We utilize the machines of our manufacturing unit by developing products under our expert’s supervision. These are available in the market at industry leading prices and are robust. We manufacture these using latest techniques and equipment. Today, most of the CNC machines have HIWIN ball screws & LM rails. We can supply any size of Hiwin products according to the drawings provided by the customer. We undertake reconditioning of Ball screws for reduction of backlash and pre-loading, Also, we accept projects with ballscrews and LM rails. The Primary function of the rail pad traditionally has been that of a conforming resilient member between the as-rolled surface of the rail, and the as-cast surface of the rail seat of the concrete sleeper. It also provides an electric insulation between these two surfaces.